CR Garden Joe will be on break for a while, a hiatus, while I trek across northern Iowa on my bicycle doing RAGBRAI. It will be more than 400 blistering miles. For at least half of next week, forecast highs in Iowa are in triple digits—we are in the midst of a historic drought and heat wave. Still, if I feel macho doing RAGBRAI, I can put it in perspective by reading this Gazette story about a World War II vet doing his first RAGBRAI. You go, Clarence! I first noticed this baby tomato Saturday when it was pea sized. It has doubled in size in one day. May it soon be joined by brother tomatoes on my vines! Well, I ate the tomato from Cate’s garden (with her permission), and made also happy discovery. 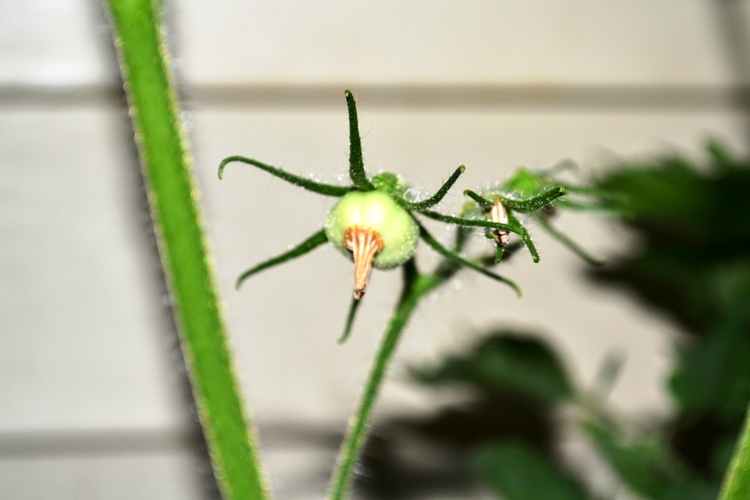 Despite the drought, a little baby tomato is forming on one of my vines. I hope it’s the start of something, we’ll see. Dry weather has descended on Iowa. There has been no rain in July, and we were already short on moisture. It’s vicious dry out there, and no end in sight, yet. I watered, and left the hose out. Going to do a second drink tomorrow morning. Well, here’s hoping that we’ll turn a weather corner soon. Think rain. 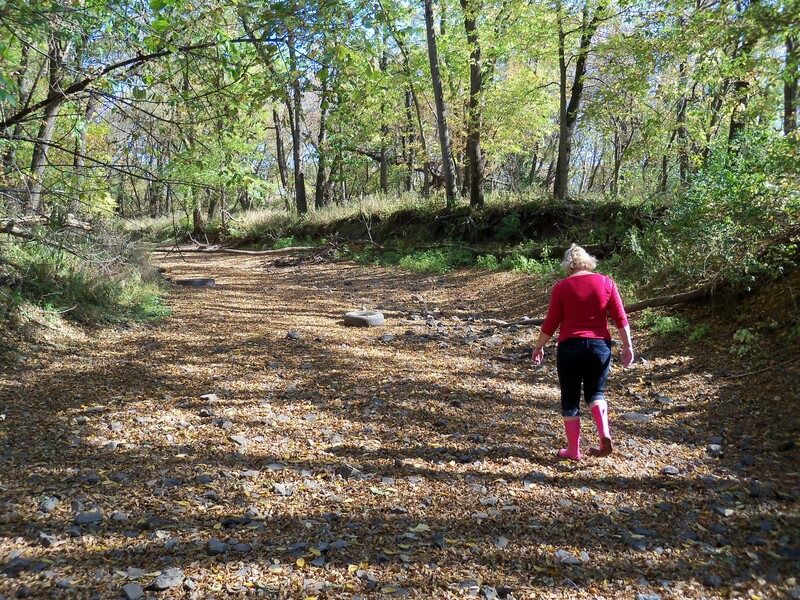 Audrey strolls along the dry creek bed of Dry Creek Oct. 9, 2011. How dry has it been lately in Cedar Rapids? It’s been several years since the bed of Dry Creek, which runs behind our house, has been dry. Today, Audrey and I took an afternoon walk. She wore her pink “puddle stomper” boots, but there were not a lot of puddles to stomp in. During the recent wet years, fish have migrated upstream from Indian Creek, and the few remaining pools are teeming with desperate life. It might rain Tuesday night, but don’t know if that will be in time to keep these pools from drying out. Posing on a log. She shot me in the same place, too. 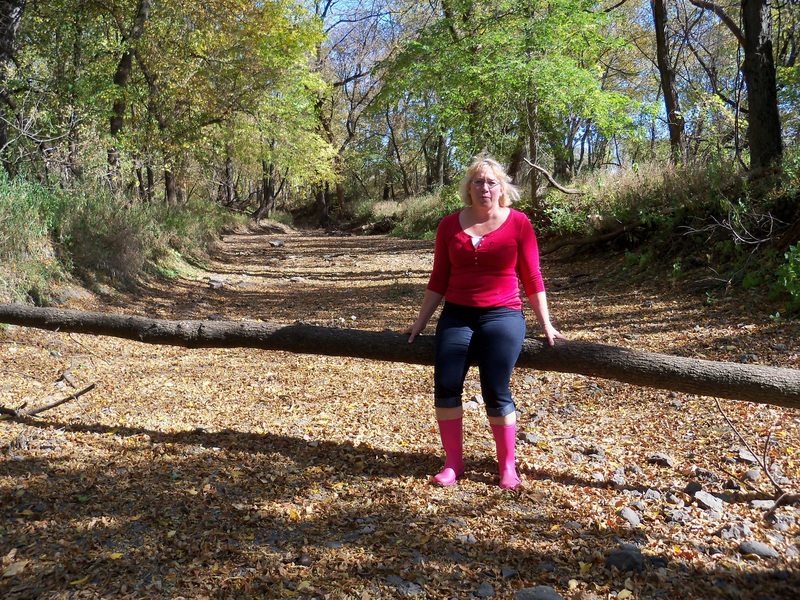 We only could walk a few hundred yards, however, until our way was blocked by water. We’ve gone much farther in the past. When my kids were growing up, it seemed like several times a year—in the dry winter months or in the hottest part of summer—the creek would be bone dry. But, as I noted, that has not been its recent trend. Until now. Well, if it’s going to be super dry, better October than July. We have some new fall planted grass that might not make it, but otherwise, dry days now won’t matter much. I just hope we get a little rain before the ground freezes hard this winter. 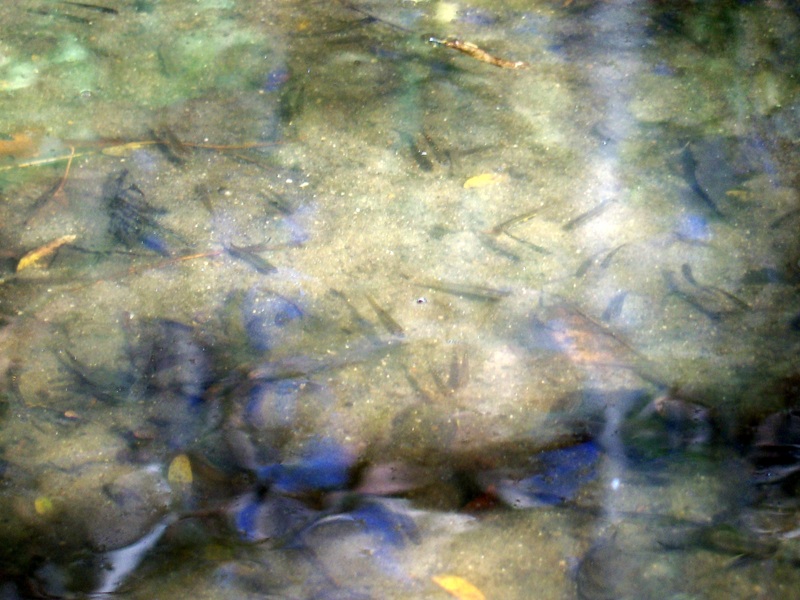 Many of the isolated pools we found teemed with trapped fish.